Thousands of students globally skipped school last Friday to protest climate change and to demand the need for action—not later but now. Young adults, teenagers, and even children have taken it upon themselves to demand to be heard by politicians and are not planning on disappearing anytime soon. In over 100 countries, varying from Germany to Croatia, the youth of the world exclaimed their frustration towards political leaders for not using their resources to begin the long road towards a better planet. It obviously won’t happen overnight, but the environment is a major issue that will have detrimental consequences if not addressed immediately. This revolutionary event is truly unique in itself: students have never initiated such a far-reaching protest on a global scale. The buildup to this current state of climate activism seen throughout the world stems down to one activist in particular—Greta Thunberg. Founder of the Youth Strike for Climate movement, 16-year-old Swedish student Thunberg began organizing her first strikes to raise awareness of global warming in August 2018. Her protests started at the steps of the Swedish parliament building right before national elections. As her platform continued to grow and inspire thousands to stand up for the environment alongside her, the Youth Strike for Climate movement turned into a global phenomenon. Thunberg has received the attention and support of numerous political leaders, including Germany’s Angela Merkel and Ireland’s Leo Varadkar. Both of these politicians are in positions of power in their country and by being recognized by higher officials, the movement has been able to reach the ears of young activists across Europe before spreading globally. Quoted in The Guardian, Paris’ mayor, Anne Hidalgo, expresses her admiration towards Thunberg and all of the activists for demanding a better future. Thunberg ignited a well anticipated movement that lit the way for a new generation of activists, inspired by the ones that came before them, and their willfulness for a better tomorrow. A reoccurring theme in the movement is the need for action—not hope. Thunberg and activists worldwide have made it clear that they have a plan and a list of demands needed to be done in order to begin the road toward a cleaner planet. On the Youth Climate Strike’s website, it states the specific demands and solutions needed to affectively end climate change. One of the demands explains that all decisions made by the government be tied in scientific research, including the 2018 IPCC report. One of their solutions includes changing the agriculture industry by reducing carbon-intensive farming and incorporating plant-based farming. In the past, people have not been keen on supporting protests because they argue it is all talk and that there is no definite action set in place. Thunberg and other activists have proved that this movement isn’t just talk. They have provided politicians the facts to implement better laws to combat climate change and this gives the movement credibility. Danielle Brand, an LIM sophomore and our assistant Culture Editor for The Lexington Line, is an advocate for climate action and has insight regarding the importance of the Youth Climate Strike. 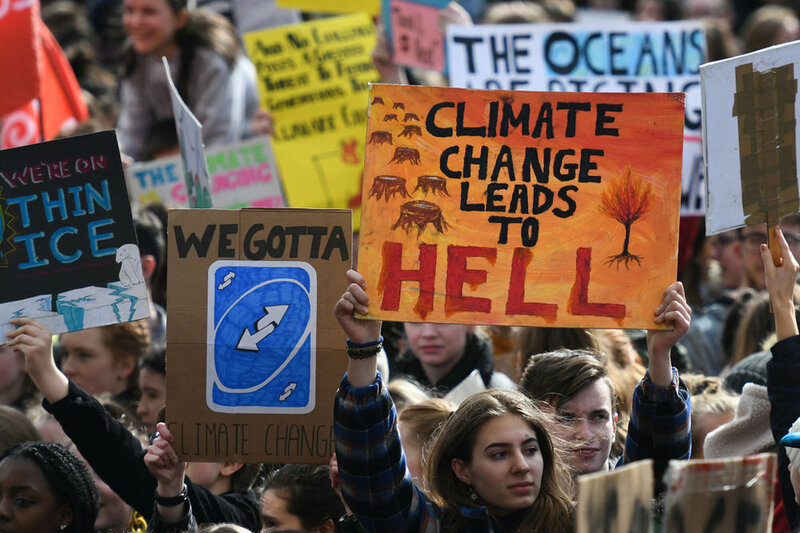 As the Youth Strike for Climate movement continues to grow in size, the impact younger generations are causing stands for itself and the time for global action is now. While hope can be used to bring people together, action is required to see definite change. It’s only the beginning for this movement and by using their voices to obtain a better future, young people everywhere are creating a plan that will have a lasting effect on the planet.